The winners of The Drinks Business Green Awards 2015 were announced on Tuesday evening this week at The Club at The Ivy in London. Notable among the winners were the UK’s Vintage Roots, which picked up an award for Organic Initiative of the Year and Retailer of the Year, while South Africa’s Backsberg Estate Cellars won the Amorim Sustainability Award, while its pioneering owner, Michael Back, was also given a Green Lifetime Achievement Award. The winners this year highlighted that it’s no longer enough to focus on greening just one area of a business, and those companies which did well had considered the sustainable nature of all aspects of their operations – whether that’s energy use and generation, water use, waste treatment, recycling rates, transport types, packaging weights and, importantly, how they actually benefit their surroundings, socially and environmentally. Promoting the winners in these awards is a pleasure for us, but also important for the industry – we need green leaders to encourage others to follow in their sustainable footsteps. 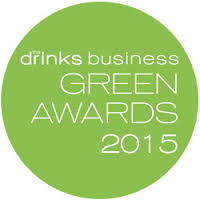 Over the following pages are the winners of the db Green Awards 2015 and a full report on the event will appear in the May edition of the drinks business.